Nicki is a young red brindle girl that raced at 58lbs. 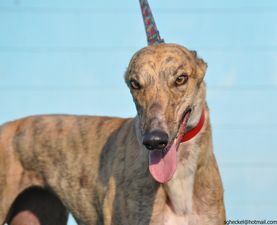 She raced 46 races at Orange Park in Jacksonville Florida. Her sire is Rhythmless and her dam is Lee Energy. Nicki is calm and quiet even though she is young and won't turn 3 until November 20th. She is doing very well in foster care and is great with their small dog and passed her cat test. More as we get to know her.